[値下げ] iScherlokk | Mac App Storeのアプリ検索・ランキング BuzzMac! iScherlokk is a lightning fast file search utility build for precise and reliable search of every file which meets the search criteria. Music, pictures, bookmarks, documents, etc can be found quickly and easily. Search can be made on any kind of build in volume, portable volume (pendrives, memory cards, USB drives), network drive (AFP, SMB, FTP), Thunderbolt or Firewire device (CD/DVD, external HDD, slave computer), etc. It does not matter if the searched file is hidden or system. The file does not even need to be indexed by OS X to be found by iScherlokk. Specify the kind of searched file(s) (music, movie, picture, etc.) or some of the file attributes (size, date, etc.). For documents or data files - a content can be specified. When searching with size range, iScherlokk calculates and displays all folders which fit in the range. 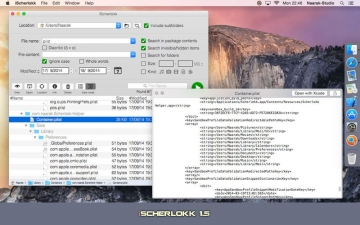 • iScherlokk searches through 'real' files instead of the Spotlight's index. The index is not always up to date and does not contain all files. 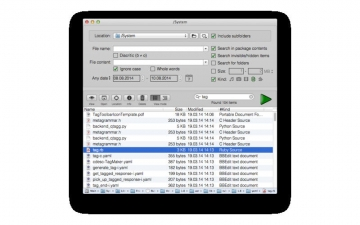 • iScherlokk shows search results in a flat or hierarchical view which helps to find out which file is the one you need and how files are located in the folders structure. Which files can iScherlokk find? Because iScherlokk is not based upon the Spotlight's index, and has its own, powerful search engine, it will find every single file on any accessible volume in your computer.